Spring has sprung and so has Vance's feet. Nothing like new shoes to put a spring in your step! We took him to get new kicks over the weekend and he measured a 7.5. His old shoes were a 6.5. Does this explain why Vance was always taking off his shoes? Sure does! We went ahead and took the shoe lady's advice and got him an 8. He's still getting used to driving them around. Poor kid keeps tripping over his feet. But if you ask Vance he'll tell you that they are, "Nice!" and "Blue!" I can't stop buying him shoes! I've bought 3 pairs! Just one more pair and I'll stop! But look how cute they are! ohmygod i can't stop posting comment!. 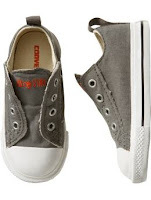 baby shoes are cuter than puppies and don't need housebreaking. buy buy buy!